We're well and truly into the second week of our term 3 holidays now, and I'm finally starting to feel rested. I've spent time with my family and we've all put in mammoth efforts to rip out our entire front yard ready to re-landscape it over the next couple of weeks. It's been inspiring to see our six boys pull together as a team and work incredibly - and I do mean that in the literal sense of the word - hard. All the hard physical labour has given me plenty of time to reflect on my and our class' learning last term and to think about plans for this coming term. I'm so proud of our class and the progress we've made this year. It's been such a privilege to play a part in the lives of these amazing young people! I have such high hopes for their futures, and am excited for my year 7s as they ready themselves for their transition to high school. OK, enough of the gushy stuff. I'm already dreading the end of the year. So, toward the end of last term a couple of students asked if we could watch The Book Thief on the last day. My immediate response was to remind them that, at our school, we don't watch movies just because "it's the last day of term" but before I could even get the words out, they followed up with all of the links to our learning programme AND the actual curriculum. You know what? They made links that I wouldn't have dreamt of but were brilliant. They took the process of getting parental permission (for a PG movie) into hand and within 24 hours I had verbal and written permission for child. The whole process was student driven and managed. Student voice in action! After the movie we held our usual end of term celebration. I push my kids pretty hard during term, so I buy them pizza for lunch on the last day of term. It's just one little way I say thank you for making my job easier by not pushing back! Nearly everyone contributes something to our shared lunch and we have a mountain of fun food. 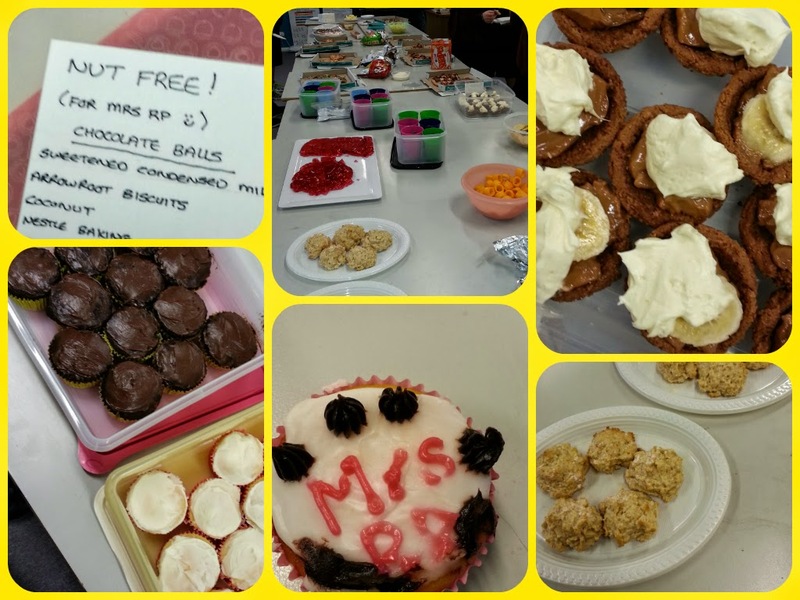 This term many of my students had gone above and beyond and cooked delicious treats for us. It's lovely that so many other teacher have messages they need to hand deliver to me around this time, so that we can share our fun with them! There was a cupcake with EVERY person's initials! And as you can guess, I have a nut allergy! At the end of term 2, we had a dance party at lunchtime as well, but this time we were all a bit tired and emotionally drained after the movie so we skipped that. The last 40 minutes of each term, we reflect on the best parts of the term and make suggestions for what we'd like to carry forward. I sit back and scribe the kids' discussion. It's their reflection, so it's particularly humbling to hear my name as both a reason behind the great learning, and the amount of fun we have. I think they may have it a little confused though: I think THEY are the reason they are learning so well, and having so much fun. I know they are one of the reasons I have so much fun at school.